Coaster Thrill Ride - The Coaster - Puyallup Original Trains Discussion. I managed to get in a few laps the second to last day of the Puyallup Fair. It is fairly well known that the three trains can give a faster/better experience between trains. Common belief is that ONE of the trains is the "first original", and the two others are "copies" of the original. I thought I remember that the Orange train was the original, but it is has been a while since I bothered to look. So, using my smart phone, I found a link, not a Coaster Buzz link, that a couple of members stated that the Yellow train was the original. So, this left me wondering if I had a brain malfunction, or if the web site was wrong. To confuse the issue a little more, the "official" Park and ACE plaques on the ride claimed that all three trains were the last remaining originals. I have a post, possibly years back, and one train did give a better ride then the other one. They only run 2 trains at a time, the extra one sits on a further portion of the one transfer track. This year, the Yellow train seemed to be the faster of the two. However, I rode it first, and up front; and have not ridden a coaster in a bit. I think I could have been mentally underwhelmed on the next few rides. The Orange coaster is quite CLEARLY of a different design in a single element. One the Blue and Yellow coasters, the foot rest includes vertical pipe braces to the front of the sheet metal body element. These braces are clearly lacking on only the Orange car. I'll also note, that I thought I saw a change in the oil system in both the running trains from what I remember last time I rode them. One other noteworthy detail is that the LAST row on the train is now no longer allowed to be ridden. I did get a chance to ride two years ago in the last row, and it was EXTREMELY VIOLENT to the passenger riding on the left side of the train when coming down the second largest hill (not the second hill); I happed to be one of those passengers. 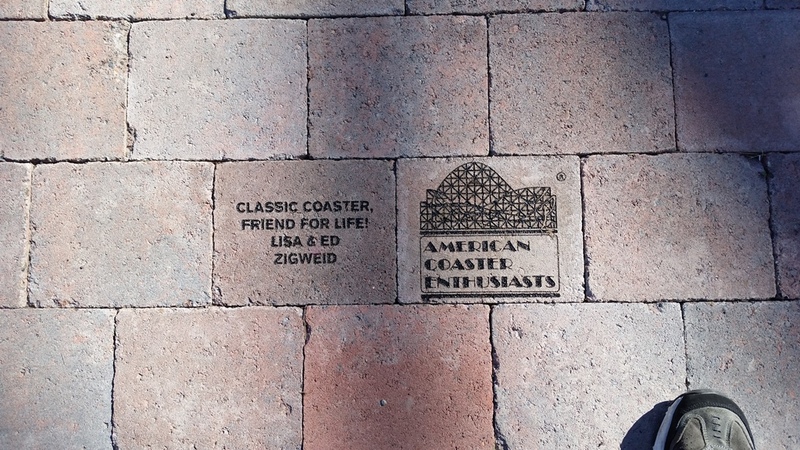 So, does anyone else have any more FACTUAL information on this coaster? Going off of memory, I think the recent sign is a Las Vegas bulb lit up sign that just states, "The Coaster". Seems to me, the Orange train is the original, but the Yellow train is now the one to ride. I'm just proud to say that I lived in Seattle long enough to know how to pronounce Puyallup. :) But I lived in Snoqualmie and Issaquah, so it wasn't a stretch. LOL! Note that I don't know of a single spell checker that does not underline the word in red as properly spelled. I have always heard it "poo-YALL-up" from the guys at Funtastic. Given that they run the midway at Puyallup, I have always assumed that to be correct. Nope... despite the spelling, it's pew-al'-up. It's one of many names in Western Washington that aren't right. The other one that drives me nuts is Sammamish, because it's pronounced suh-mam'-ish, even though it's spelled sam'-muh-mish. 1. You know how to pronounce Sequim, Puyallup, Enumclaw and Issaquah. 53. You know how to pronounce geoduck and know that it doesn't quack or have feathers. Little bit of a thread derail, but Jeff got it right. ...the "official" Park and ACE plaques on the ride claimed that all three trains were the last remaining originals. Since your link, when I click it, is to the ACE Facebook page, I'm not certain the point. I can not imagine that the ACE Facebook page would have any different information than is on the fancy bronze plaque on the ride itself. I am confused by your post and link; as I don't see any new information. Thank your for your effort though. My SWAG at the moment, is that the train "design prints" were created by one company. Then the manufacture was done by other companies of the different trains.